In Lowndes County, Alabama, there is a lack of municipal wastewater treatment facilities that reflects a pattern of racial and environmental injustice that has been present in that area for a long time. Most parts of the county are rural and depend on septic tanks, which are expensive, and often break down or don’t work at all due to the makeup of the soil in that area. Lowndes County exists in the “black belt” region of the American South, an area mostly in Alabama and Mississippi that got its name from the color of the dark, fertile soil that exists there. Many residents of Lowndes County do not live there by accident; their ancestors were brought to the black belt against their will and enslaved, forced to work as unpaid labor. Many slaves were brought to the black belt region due to the fertility of the soil and the need for labor on plantations to take advantage of the soil. Even when Black Lowndes residents own their land and home, the conditions that they live in are creating terrible health outcomes. More than 150 years after slavery was abolished under the U.S. Constitution, the soil that brought the ancestors of Lowndes residents to that land continues to betray them. Bass Connections allowed many of us working with the Alabama Center for Rural Enterprise (ACRE) (click here for more information about the ACRE-Duke Partnership) on this issue an opportunity to attend a Racial Equity Institute (REI) training. On November 3-4, 2018, four of us attended a weekend workshop in Chapel Hill, hoping to better position ourselves as researchers, advocates, and allies of Lowndes County residents. We felt that our ability to work for residents of this majority-Black county in Alabama relies on us doing everything we can to understand the truth of how history, white supremacy, and institutionalized racism have fed into the current public health crisis in Lowndes County. The REI trainers explained the historical context and showed us how racism evolves and adapts over time. The situation in Lowndes County is a profound example of how historical, structural, and systemic racism can influence people’s health and every facet of their lives; and beyond the context it applied to the Bass Connections project with ACRE, I came away with a new perspective and a mission to apply what I had learned in other parts of my life. At the REI training workshop we learned about implicit bias and how all people have two kinds of reactions to things: first, an immediate gut reaction based on the images, words, and perceptions that we’ve been bombarded with since birth, which include racist beliefs or underlying ideas whether we consciously and explicitly agree with them or not; and second, the more logical, reasoned reaction which takes more time and conscious thinking to reach. It is important to acknowledge that we all have these immediate gut reactions so that we can understand our own implicit biases. We did an interesting exercise, during which we tried to come up with reasons someone in line at a supermarket might be using SNAP benefits, in which we realized that all the gut reactions we have to seeing someone in a less fortunate situation place blame on the individual, while all the logical, reasoned reactions and explanations that we came up with in the same situation had to do with society: the ways systems and institutions had affected or failed that individual. It is easy to place blame on an individual for the situation that they are in, but we must learn to see the bigger picture. Looking at environmental justice issues through this lens of societal-level failures helps us to understand how minority communities have experienced adverse health impacts based on unspoken discrimination over time in addition to the purposeful actions and decisions of white supremacists throughout history. The people of Lowndes County are experiencing a serious environmental justice issue through no fault of their own, and it is incumbent upon the rest of society to see the issue for what it really is: a legacy of slavery and white supremacy, which brought people to this land against their will and then trapped them there. I’ll be taking many things from that weekend with me, but one of the most impactful things, personally, was an exercise we did about gatekeeping. I learned what gatekeeping means (basically, controlling or metering access to information, resources, and power) and I learned (as did all the attendees) that I am a gatekeeper. I plan to take this lesson forward with me, beyond graduate school. As I reenter the working world and shape my career, I will try to keep this in mind: that even when we don’t realize the impact of our own actions and decisions, they are important to disenfranchised or less empowered communities, so we should be examining our actions and decisions to understand their full impact and constantly challenging ourselves to see the bigger picture and the ways that we influence communities that we work with. Growing up in a dilapidated two bedroom apartment with my four siblings and mother in North Dallas, we faced infrastructure issues that posed significant health risks to our lives. Every winter our faucet water changed colors because of frozen drainage that would cause residue backup forcing us to be unable to even brush our teeth with the contaminated water. Our old pots would be home to maggots because my mom had her hands full juggling multiple jobs and taking nursing classes while supporting her kids to be able to consistently clean the dishes, and my siblings and I were too young to effectively do the dishes ourselves. There was even a time our bathtub overflowed with toilet water because of a sewer line clog and we had to manage one restroom because of our inability to afford a plumber. This was all symptoms of living with very little money in substandard living conditions. When I was invited to go to the Climate and Health conference in Atlanta during my freshman year, I had flashbacks to my childhood. Catherine Flowers’ gave a talk on the environmental injustice and poverty that has led communities in Lowndes County, Alabama to live in substandard housing with failing wastewater infrastructure where they are threatened by pathogens. I decided to be part of the Duke-ACRE partnership then, to possibly aid in these families’ transition into better homes or possible replacements of their wastewater systems. The situation of Lowndes County community members who are facing this issue is stemmed from an intractable intersection of political, financial, and engineering barriers that requires the students, faculty and staff under the Duke-ACRE partnership to travel to Lowndes County to gain a better understanding of how to address the issue. In these travels we learn first-hand about the lived experiences of the community members faced with these wastewater issues and read up on the racial and environmental injustice history in the region that created the conditions for these issues to exist in the first place. Even though a long term solution to the wastewater infrastructure issue in Lowndes County requires a completely novel method to treat wastewater, I identified the financial barrier to decentralized system replacements as a project I wanted to focus on. This semester I have been able to do extensive research on the Farm Bill, the Water Infrastructure Finance and Innovation Act, and the Clean Water State Revolving Fund to understand possible avenues for funding replacement or rehabilitation of those failing decentralized systems. My time in the funding team has been both educational and a bit frustrating. It has been frustrating diving into legislation that legitimately does not seem like viable options for the people in Lowndes County who actually face these issues. The number of barriers that even the funding mechanisms seem to have seems endless. Loans are not viable because it is out of the question to expect low-income households to take out thousands of dollars in loans to finance a system that is expected to fail by the time they can even pay off their loan. Access to information on funding mechanisms seems non-existent because there is both a lack of understandable material available on financing individual infrastructure projects and the information that is available is incredibly dense. And, projects are mostly focused on large scale community projects which require substantial clearance from local and state governments, and individual financing avenues seem nearly non-existent. But, the knowledge I have gained on taking a community based approach in understanding and attempting to solve intractable community problems has been invaluable. These barriers have only increased my interest in researching more viable funding options for these community members. So many groups tour the lives of the Lowndes County members who are affected by inadequate wastewater infrastructure. I want to be part of the group that takes substantial steps to help mitigate the injustices that are pervasive in areas like Lowndes County. It would be unreasonable for me to not have in mind that there would be many obstacles in the way of this goal. It has been wonderful working so closely with Catherine Flowers who has a legitimate interest in seeing the injustices in her community addressed. 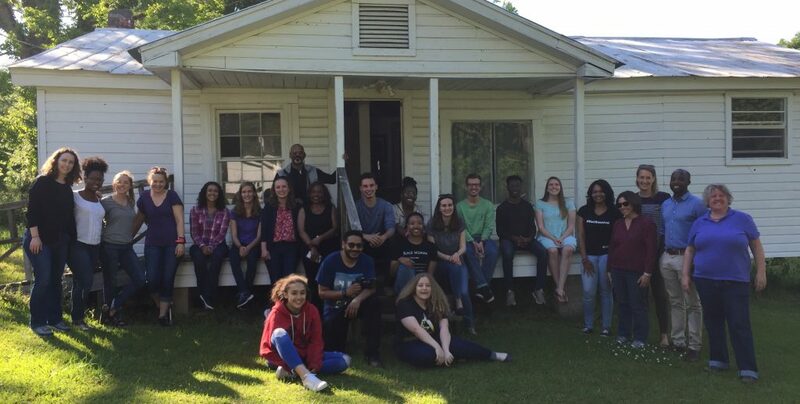 It has been wonderful working with so many bright young, and older, scholars and educators in researching avenues for change for the low-income residents of Lowndes County, Alabama. And, it has been wonderful challenging myself to think of creative, innovative ways to possibly address injustices that pervade so many low-income households in America. I am glad I have been able to take steps to address some of the problems that I faced growing up, and I am excited to see where my, and the other members of this Bass Connections teams’ research will take us.